The William Wallace Monument located in the stone age settlement of Stirling, Scotland, a city that surrounds the fortress Stirling Castle and the medieval old town of Stirling. Once the capital of Scotland, Stirling is now a flourishing city for local government, higher education, retail and industry. Stirling, “Gateway to the Highlands”, is strategically located near the Highland Boundary Fault between the Scottish highlands and lowlands. Glasgow architect J.T. Rochead designed and built The William Wallace Monument in 1861-1869. The massive tower built at the summit of the Abbey Craig dominates the landscape for miles. It is a constant reminder of the fierceness that Scots have shown for their freedom and for their independence. The Abbey Craig is a tall hilltop comprised of quartz-dolerite. Archeologists have found evidence of an early Iron Age fort on the abbey by the remnants of “vitrified” walls. Vitrified walls are created by melting stones in a matrix of wooden posts. The posts are then burned to form the ‘vitrified’ wall. For those who are up for the challenge (or for kids who have energy to burn off) there are numerous walking paths to the top of the Craig. The walk, naturally all uphill, will take about 20 minutes from the parking and visitor area. There is also a shuttle bus, which at the time, I wish we had taken! My legs were so tired that I wanted to lay down on the side of the road and have the shuttle pick me up on the way down! It was a very beautiful walk with awesome views and many picturesque opportunities. It was worth my energy expenditure – I just wish I knew how many calories I burned off! The Monument, built in the 19th century, commemorates a 13th century warrior, Sir William Wallace. Also, known as The Guardian of Scotland, Wallace gave his life in the fight for freedom and independence. The tower, built in the Victorian Gothic style from sandstone is an impressive 220 ft (67 meters) tall. It has a whopping 246 step staircase that leads to each of the three exhibition galleries and the ‘crown’ at the top of the monument. If you have pushed through the exhaustion burning through your legs and walked up all 246 steps, kudos to you! The crown is the jewel of the tower – you can see beautiful Scottish landscape for miles. The first gallery that you will encounter is the Hall of Arms. 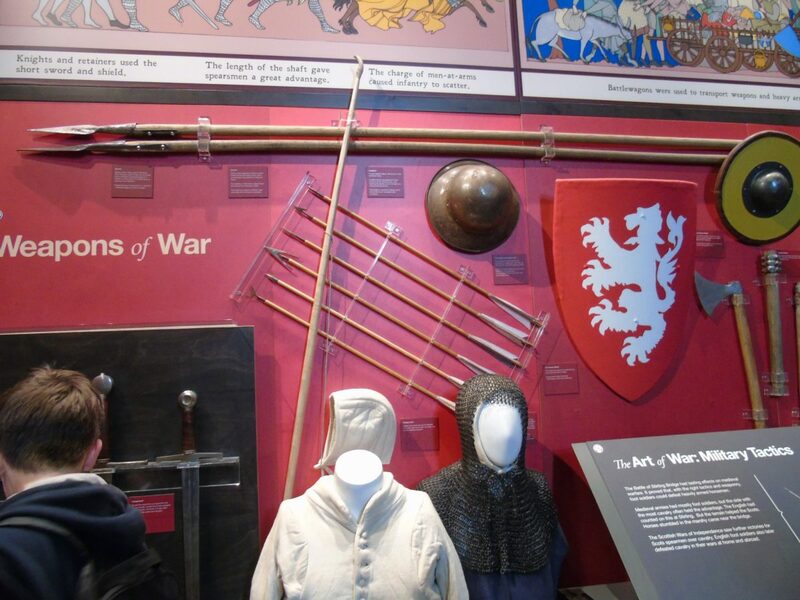 Banners and plaques line the walls telling the story of the Battle of Stirling Bridge on September 11th in 1297. The battle had major significance in Scotland’s history and in the history of medieval warfare. The battle was commanded by Sir William Wallace who lead a common army of enlisted spearmen, defeated feudal knights in full armor. This battle is of particular significance to the Scottish people because it is the first time that a major English army had been defeated since the Dark Ages. This victory empowered the Scots to triumph over the English. The second gallery is the Hall of Heroes. Here there are 16 busts of men who are considered heroes in the fight for freedom and reform. These busts include historically important men such as King Robert the Bruce (1274-1329), Robert Burns (1759-1796), James Watt (1736-1819), and John Knox (1510-1572). James Watt invented the steam locomotive which was the springboard for the Industrial Revolution. John Knox was a religious man who spurred reformation of the church. The third gallery is the Royal Chamber. There were many trials and obstacles to overcome in the building of the monument. Obstacles included who would design and build it, where would it be built, and budget woes to name a few. Those who make the trip to the top of the Crown, will be rewarded with breath-taking views. Ben Lomond and the Trossachs in the West, the city of Stirling and the Ochil and Pentland Hills in the East. Cool! I want to see this one day! You should! It is worth the trip!